Dr Simon Park, a bacteriologist by training, creates artistic works using the natural creativity of these powerful microorganisms. Park, a senior lecturer in Molecular Biology at University of Surrey, whose interest in microbiology dates back to the science fiction novel The War of the Worlds, started to create living bacteria works a decade ago. His art derives from a need to disclose the wonderful attributes of some of the oldest living organisms. But why are bacteria so fascinating to him? C-MOULD, the world’s largest collection of bacteria and fungi for use in the arts, is the answer. Created by Park over the last decade, it gathers microorganisms with extraordinary properties that range from an extensive living colour palette made of pigmented bacteria, to bacteria that make light, are electrical conductors, or produce gold or biomaterials. Vogesella indigofera, a toxic waste-eating bacteria that produces a singular blue pigment, and the human pathogen Serratia marcescens and its red pigment are just two examples of this unique collection that explores the artistic possibilities and nature of these microbes. By using a particular strain of the cellulose-producing species Gluconacetobacter xylinus, and different bacterial pigments as ink material, Park created the first book made of grown bacteria. And he couldn’t have thought of a better title to recreate; On the Origin of Species is a eulogy for Charles Darwin and the idea that all species have evolved from the first bacterial organisms. 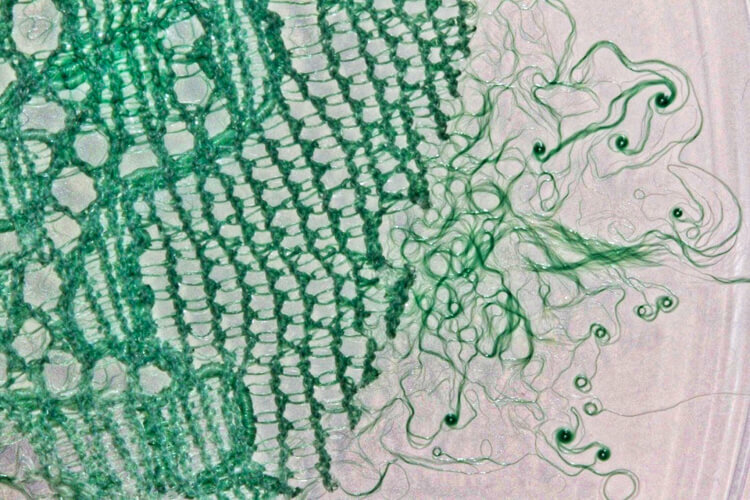 Park’s most recent works focus on Cyanophyte-based microfibers, a “photosynthetic” biomaterial that only needs sunlight and air to form, liberating oxygen as it does so. Together with conceptual fashion designer Victoria Geaney, they explore further the connection between humans and microbes in the natural environment, creating Oscillatoria Sutured; an ecological biotextile that by self-designing itself will suppose a revolution for the world of biomaterials in fashion. Park’s explorations and research intend to put out there the hidden wonders of bacteria for the public to enjoy and be delighted with. He blends art and microbiology with such beauty and meaning that some of us would have never guessed possible. Dr Simon Park, you are Senior Lecturer in Molecular Biology working at the intersection of biological systems and hybrid biomaterials. Could you tell us a little bit about the intellectual process behind? “No one would have believed in the last years of the nineteenth century that this world was being watched keenly and closely by intelligences greater than man’s and yet as mortal as his own; that as men busied themselves about their various concerns they were scrutinised and studied, perhaps almost as narrowly as a man with a microscope might scrutinise the transient creatures that swarm and multiply in a drop of water. With infinite complacency men went to and fro over this globe about their little affairs, serene in their assurance of their empire over matter. It is possible that the infusoria under the microscope do the same.” From H.G Wells, The War Of The Worlds. A classic Science Fiction book, which I read as a teenager, first gave me an insight into the power and impact of the microbiological world. The War of the Worlds by H. G. Wells is bookended by two very vivid depictions of the nature and power of microorganisms. At the very start of the book, there is a description of the Martians regarding the Earth and its inhabitants as scientists might look down a microscope at infusoria and microbes here on Earth (see quote above), whilst it ends with the Earth’s microbes infecting killing the alien invaders, and thus saving humankind. At this point, I first became aware of the vast, yet usually hidden, power of the Earth’s microbes, and this revelation steered me into a career as a research microbiologist. My personal path to working at the intersection between art and science began 10 years ago. At the University of Surrey, I teach a module called Practical and Biomedical Bacteriology, which is a 1st year undergraduate lab class that introduces our students to bacteriology. As a fun aside to the main experimental work, I get the students to make simple drawings from a limited palette of pigmented bacteria that we have (red, purple, yellow, pink). The students draw things like cats, Homer Simpson, and messages etc. Because of this, I’ve often thought that someone with real ability to paint could make a painting out of pigmented bacteria. 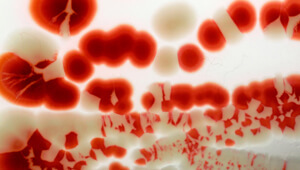 Then, in 2006, an artist called Jo Wonder contacted me out of the blue and said that she wanted to work with bacteria. We talked, I told her about my living bacterial paints, and we applied to, and then got funding from The Wellcome Trust to make a version of John Millais’s famous pre-Raphaelite painting Ophelia completely out of living and pigmented bacteria. To do this I had to extend our simple coloured palette and thus, I spent around six months researching for, and collecting naturally pigmented bacterial species, so that by the end, the artist had a unique and extensive palette of living bacterial paints at hand. Despite common misconceptions and their diminutive size, bacteria are very complex organisms, and possess many other interesting, and potentially useful properties, beyond the production of just colours, and so, a natural extension to the Ophelia project was to identify, and then collect bacteria with other interesting features too. Today, I am the curator for a unique collection of bacteria that I have acquired over the last 10 years, all with unusual or interesting properties, and which form C-MOULD, the world’s largest collection of microorganisms specifically for use in the arts and design. Included in C-MOULD are examples of bacteria that can make elemental gold, produce electrically conductive nanowires, or produce light. In particular, bacteria that produce novel biomaterials feature prominently in C-MOULD and two of these form the basis of the recent projects outlined below. Gluconoacetobacter xylinus is a non-pathogenic bacterium, which, as long ago as 1886, was shown to be able produce cellulose, a characteristic previously thought to be confined to plants. In nature, the bacterium is commonly found on rotting fallen fruits, but its remarkable ability to produce cellulose, has also made it of great interest to researchers seeking to develop novel biomaterials. In C-MOULD, I have a unique hyper-cellulose producing strain of this bacterium called GXCELL, which was originally isolated from Kombucha, and which rapidly forms very thick mats of this versatile and natural polysaccharide. 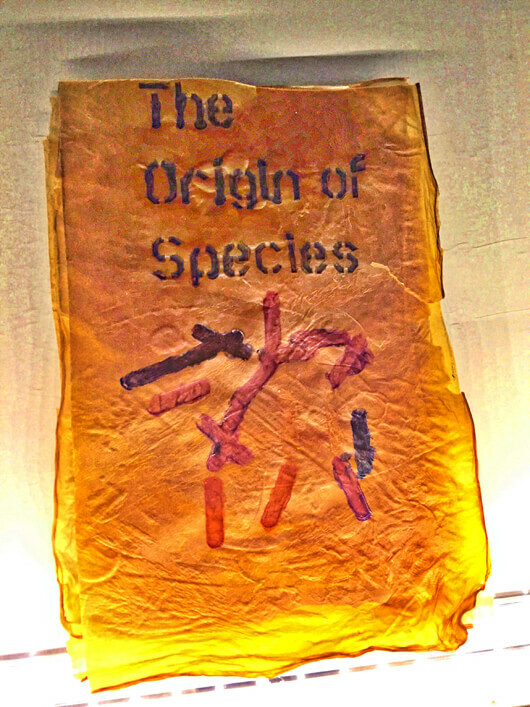 The first project was an exploration of the potential of this bacterium to make novel biomaterials and thus to attempt to make a unique book that was made entirely from bacteria, both its pages and ink (Figure 3). Paper is produced from wood pulp, and its production has significant environmental impact, it having a number of adverse effects on the environment including deforestation, and air, water and land pollution. The project then highlights the potential of cellulose producing bacteria to generate paper via more sustainable and less environmentally damaging processes. The production of the printing inks is also an intensively chemical and unsustainable process and so rather than use conventional synthetic inks to print and illustrate the book I decided to use the pigmented bacteria, which I first collected for C-MOULD (above), and that first piqued my interest in microbiology and art. I chose Charles Darwin’s seminal work as the book as a playful take on our modern understanding of evolution, and the fact that all life as we know it today, evolved from bacteria and related organisms, and so that in a sense bacteria are the origin of all species. The bacterial cellulose that we used to make Origin of Species is rather brittle and so we are seeking ways to make its properties more paper-like. 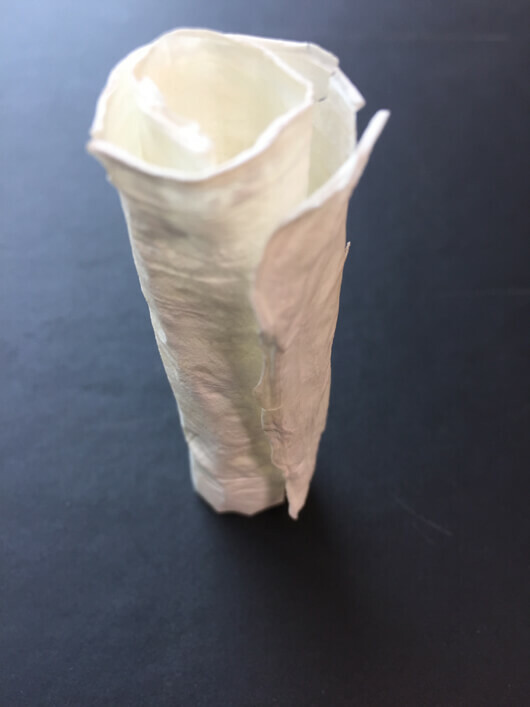 In this respect, we have recently developed a simple treatment that does just this and results in a type of bacterial cellulose that is white and can be folded, and which is much akin to paper (Figure 4). I’m always seeking to expand the content of C-MOULD to include ever more interesting bacteria and in this sense one very important group, that was not represented until recently, was the Cyanophytes. These bacteria are aquatic and photosynthetic bacteria that have been hugely important in shaping the course of evolution and the content of the Earth’s atmosphere. The oxygen rich atmosphere, upon which we depend, was generated by vast numbers of newly arisen photosynthetic cyanobacteria during the Archaean and Proterozoic eras. Before this time, the Earth’s atmosphere had a very different chemistry and was unsuitable for life, as we know it today. The other striking contribution of the cyanobacteria to the evolution of life is in the origin of plants. The chloroplast, the organelle within the cells of plants which carries out photosynthesis, actually derives from an evolved cyanobacterium living within the plant’s cells. At some point in the late Proterozoic, or in the early Cambria periods, cyanobacteria became resident within eukaryote cells, making food for the eukaryotic host in return for a home, in an event known as endosymbiosis. C-MOULD now contains a number of cyanobacteria, and because these organisms are photosynthetic, and can grow with just sunlight, air and water, I am now exploring these bacteria as sources of unique and sustainable biomaterials. This new project then is an evolving body of work, which specifically explores the filamentous cyanobacterium Oscillatoria animalis in this respect. I’ve discovered that, not only does this bacterium produce biomaterial from little more than sunlight and air, but that the individual microscopic filaments of the bacterium, which equate to the fibres in textiles made from it, have a unique oscillatory motility meaning that materials created from it are self-weaving and also self-repairing (Figure 5. A, B). What directions do you imagine taking your work in? I’ll definitely be extending the two biomaterial projects outlined above, with the hope of scaling up the works into larger installations. 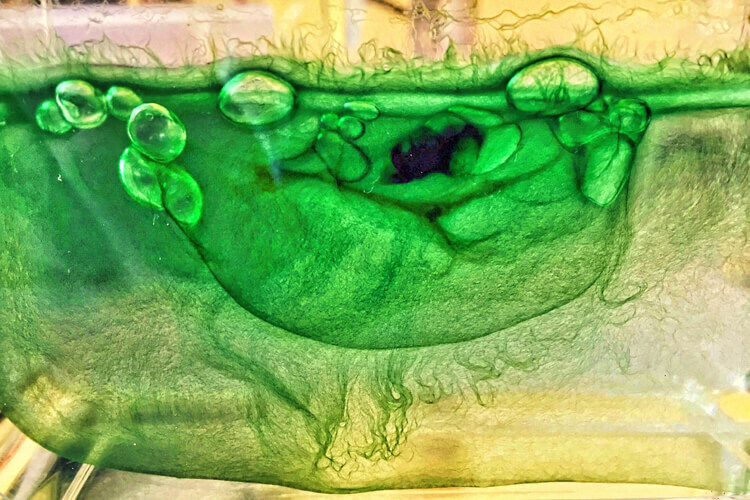 In the latest development of this project, I’m collaborating with conceptual women’s wear designer Victoria Geaney (Royal College of Arts), and together we are investigating this unique biomaterial as it establishes symbiotic relationships with traditional fabrics to form unique Cyanophyte/cotton hybrid biomaterials (1). Hybrid art, genetic art, bioart. Considering the new disciplines appearing in the last few years and more intellectuals writing about it, should we still be using any of those terms or is ‘biomedia’ as Jens Hauser theorizes the most appropriate? This question makes me smile as a microbiologist, as within this scientific discipline, bacteria are continually being renamed and reclassified. In the traditional phenetic process of classification, bacteria are grouped together into genera and species on the basis of shared characteristics, like cell shape for example. The more modern phylogenetic approach seeks to classify bacteria on the basis of evolutionary relationships, and through this many well-known groups of bacteria have been broken up and their members reclassified. From the question above, it would seem that art faces similar taxonomic challenges. In any case, I think that there is a wonderful diversity in art that uses biology whatever we choose to name it as. As someone with a background in science, I see works in this area occupying a continuum between art and science, and art differing markedly in the depth of their engagement with the science, so my temptation would be classify art in this area on the basis of this. According to a paper in Science (January 2016), ‘we are in the midst of the so-called sixth great extinction, the Anthropocene or the age of the humans’. What biotechnical invention that will have more impact in real life in a not-too-distant future? I think that as the Anthropocene unfolds, the environmental instabilities that are generated will initiate episodes of directional natural selection in microbial populations. It seems already that microbial evolution is currently keeping apace with the environmental changes brought about by humanity, and this includes measurable changes in the human microbiome, the accelerated dispersal of disease-causing microbes, consistent selection for antimicrobial resistance, and even changes to global biogeochemistry cycles. In terms of sheer number and activity, bacteria are regarded as the dominant form of life on Earth, and it’s almost impossible to imagine that they won’t respond and adapt to, and thus contribute in some way to the processes of the Anthropocene but whether this will exacerbate or ameliorate changes in climate change remains to be determined. In any case, I think if we need to look to and exploit the vast microbial domain of life if we are to develop biotechnical interventions to ameliorate climate change. For example, there is evidence that ocean dwelling bacteria, removed carbon dioxide from the Earth’s atmosphere, to end a period when carbon dioxide levels soared, temperatures rose by 5 oC, and ocean acidity spiked. There are also already some promising candidates such as methanotrophs, microbes that can oxidise, and thus remove the powerful greenhouse gas methane from the atmosphere, and also many types of bacteria that can consume carbon dioxide. What is your chief challenge of creativity? The time available to me for putting ideas into action. Quite literally my microbiome/microbioata, that is, my other bacterial self.